National Aboriginal Hepatitis C Awareness Month May 1st – 31st - JHG Consulting Network, Inc.
As the evaluators for Pauktuutit Inuit Women of Canada’s Sexual Health Project, we are heading to Parliament Hill on May 1st to observe the official launch of National Aboriginal Hepatitis C Awareness Month. Amy Knobelsdorf and Wanda Jamieson are pleased to be attending this event and look forward to gathering insights from participants. 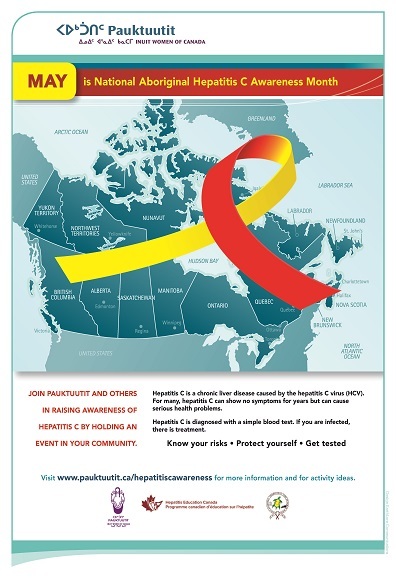 Pauktuutit Inuit Women of Canada, the Canadian Aboriginal AIDS Network, and Hepatitis Services, BC Centre for Disease Control, are partnering on this national campaign. Visit http://pauktuutit.ca/hepatitiscawareness/ for more.